The plane is landing. And I’m still tidying the cabin. I grab my wellies and pull them on; we leap into the dinghy, and Nick pulls hard on the oars. 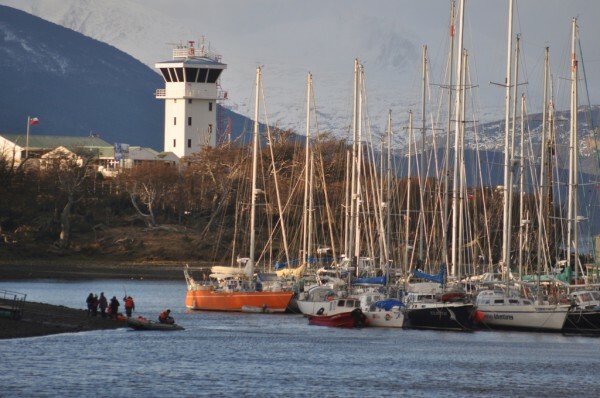 The creek is just 100 yards wide, but Puerto Williams airport is one of the smallest in the world. By the time we’ve landed and I’ve scrambled up the bank, the last of the passengers has already climbed out of the Twin Otter and is walking into the tin-clad terminal building. I take a few deep breaths before I march up the steps. I don’t want to go rushing in, panting like a lunatic. Up the concrete steps and through the door, then, and into the little room. Ten or twelve people are milling about – but none of them are Buddhist monks. So… Now what? In the next instant the door behind me swings open and one of the tallest people I’ve ever met is suddenly looming over me. I’m probably supposed to bow – that’s what they do at Luang Por Sumedho‘s monasteries in England; whenever a lay person meets a monk, they bow – but I’ve never been shown how to do it, and I’m not about to have a go now. “Hullo!” I say, and we stand there, getting the measure of each other – with me looking up and Ajahn Asoko peering down. It must be strange to be always looking down at people; and always ducking through doors… And I’m not sure that he’s going to fit in the cabin, never mind Caesar‘s bed. “Using the bathroom,” Ajahn Asoko says; and in the next moment the door behind us opens again and out comes an elderly man wearing the Forest monk’s sienna-coloured robes. To my surprise he isn’t the tall, imposing man that I had imagined; rather he appears to be not much taller than me, and he seems almost shy. But his face is lit by a warm smile. Once again, I consider making my debut at bowing – with palms together in front of my chest – but the moment is gone. “Shall we go?” I say. “We have to wait for our bags,” Ajahn Asoko explains. Bags. I thought Forest monks didn’t own anything except their robes and their bowls. Ah, but they’ve been given things especially for this trip: Cold weather clothing and wellies. Happily, the bags prove to be very small. Stowage is always a problem on a boat, but these monks’ bags are less than a third of the size of the back-packs which previous ‘travelling light’ guests have brought aboard. Out we go, into the sunshine. These two chaps must have been making some very good kamma; they’ve brought one of the warmest days of the summer with them. I’m about to remark on the fact when something else grabs my attention: As we stroll across the lane and towards the beach it suddenly becomes clear that Luang Por Sumedho is not going to find it easy to walk down the slope to the dinghy. I didn’t know that he had a problem with his feet. (A problem which began in his youth, we later learn, before he even became a monk.) If we’d known that walking was painful and difficult for him then we could have organised a taxi. As it is, we thought it would be nice for our guests to arrive at our boat in the proper way, by water. The Micalvi and Mollymawk from the airfield, with the Dientes mountains beyond. “Can you manage this, Luang Por?” his assistant asks, offering his arm. And Luang Por Sumedho chuckles and takes the arm. If he’s at all fazed he certainly doesn’t show it, but I’m embarrassed to have put the esteemed gentleman in this predicament. We climb into the rubber dinghy – with Luang Por still chuckling. I’ve read that he has a rowing machine, but seemingly he has never rowed anywhere other than across his kuti (or monk’s hut). Arriving on the other side of the creek, we point out Mollymawk, nestled amongst the other boats but carefully positioned to make it easier for our guests to get aboard. Luang Por laughs again. I wonder whether that means she’s too small, or too shabby, or too… Too what? What does he think of her, I wonder nervously? Our guests have been travelling since midnight. We welcome them into our cabin and offer them tea and coffee, but Luang Por is yawning his head off and says that he would like to retire. I lead Ajahn Asoko into the aft cabin – and to my surprise and dismay he immediately looks worried. “I’m not sure whether Luang Por will be able to climb up there,” he says. The aft cabin bed occupies one third of the cabin. On the centreline, running for and aft, there’s a bench seat; and in order to get onto the bed one has to step up onto the bench and over a low wooden fence – a lee-cloth, in yachting parlance. The purpose of the lee-cloth is to stop the occupant from tumbling out when the boat heels. If you’ve lived with such things all your life you take them for granted, but if you weren’t brought up messing about in boats… well, then the obstruction probably seems inexplicable. Should I offer to cut it off with the jigsaw, I wonder…? No! Nick would hit the roof. Nick has been very understanding. He happily agreed to have two complete strangers with funny rules come and share our home for a week. 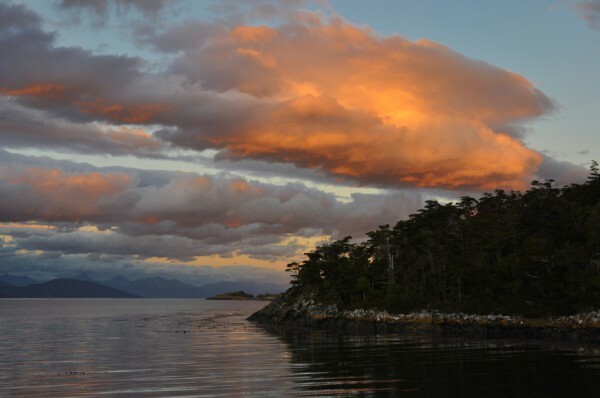 He readily went along with the change in our itinerary, agreeing to stay in Tierra del Fuego for the summer instead of heading north as had been planned. He’s gone to a lot of trouble to fit the radiator and the aft cabin door to make the place more habitable. But he’ll draw the line at sawing the boat apart. Luang Por will just have to manage. Somehow. Please! “Yes,” he replies, without the least hesitation. I watch closely, and I notice that even while we’re speaking Ajahn Asoko always knows exactly where everybody is – ahead, or behind, to this side or that – including Poppy-Dog. Whenever I mutter, “Where’s Poppy?”, or I call her, he already knows where she is. “How do you do that?” I ask. He explains that it’s a bit like a mother cooking the dinner but also keeping one eye on her toddler; or, as in this case, on several toddlers. Well, now… I used to have to keep an eye on two toddlers while I worked – and it was sharp eye that I kept, because our home, then as now, was surrounded by water. So I can do this, if I try. 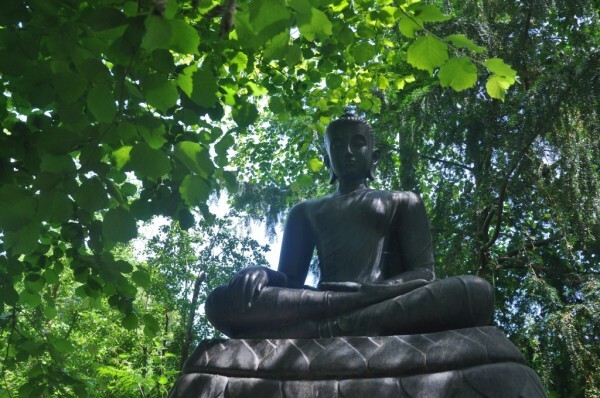 This is my first Dhamma lesson: Total mindfulness is attainable – even for a scatterbrain such as me. We got underway the following day at dawn. 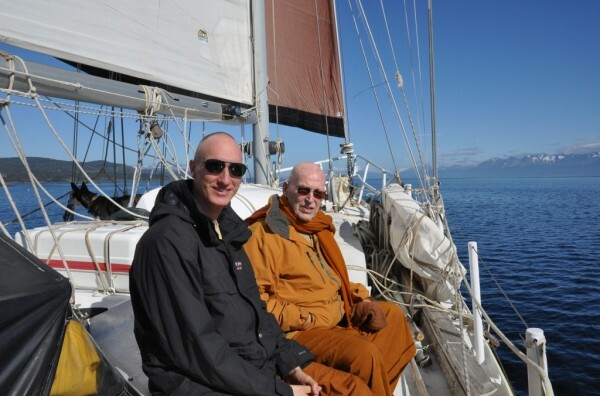 Luang Por had originally said that he would like to see Cape Horn, but just a couple of days before their arrival Ajahn Asoko had written to say that he had changed his mind and would prefer to visit the glaciers. This, as it happened, was just as well, because the forecast for the Horn was for gales all week. The Horn is one of the world’s most significant landmarks, but the glaciers of the Beagle Channel are far more spectacular and we were glad to have the chance to show them to our guests. However, getting there and back within the available six days would not be easy. When we headed this way on our own it took us almost a month to reach the most spectacular fiord, and the one which we wanted to show to Luang Por. Tied to the monks’ tight schedule, we now had to operate in the same way as the local charter boats. There was not a breath of wind, but rather than wait for Aeolus to awaken, we had to motor flat out. 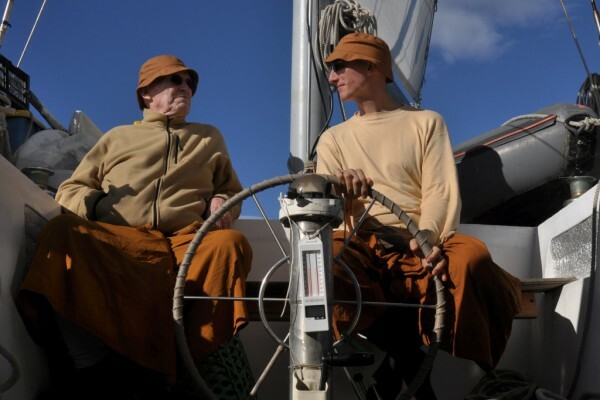 Ajahn Asoko was up and about and eager to help as we left our moorings and slipped away over the navy-blue silken sea. No doubt the rackety-bang of the engine must have disturbed Luang Por’s meditations – or perhaps not. The Buddha was apparently able to remain deeply absorbed in meditation while six hundred oxen-drawn carts trundled past beside him. Luang Por emerged for breakfast and ate his porridge but then quickly scuttled back into the aft cabin. Having paid him a visit to see if he needed anything, Ajahn Asoko came on deck looking grave. “We can turn back if we need to, I suppose?” he said. Oh, no! Naturally, both Nick and I immediately gave our smiling assent – but inside I was devastated. After so much preparation…! After so much anticipation…! 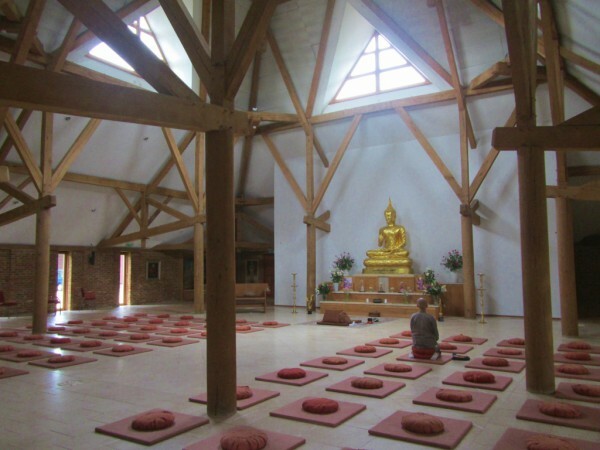 Then I remembered how I’d felt on my first day at Cittaviveka, the first monastery which Luang Por founded in England. On initial acquaintance the routine and the rules had caused me a lot of stress. Luang Por, meanwhile, had now spent close on 50 years living according to that same monastic discipline, and the disruption of his habits must surely be equally upsetting. Not only this – for the past 30 or so years Luang Por had been honoured and adored, and treated like royalty. If I hadn’t actually managed to bow, I’d certainly treated him with a respect far greater than I would pay to Queen Elizabeth II… but it had to be said that his accommodation was not fit for a king. 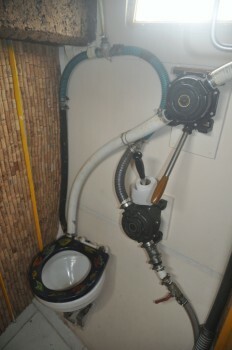 What must he make of our bathroom facilities – of the curtain door and the lack of a wash-basin; of the complicated system by which a ship’s toilet has to be pumped out rather than flushed at the press of a button? “But I don’t want to be the cause of his suffering!” wailed the First Voice. While I cooked lunch these two Selves argued with one another, and Awareness watched them and tried to concentrate on preparing a delicious Cauliflower Cheese with Sliced Potatoes and a Side Salad. For pudding we would have fruit cake, which had already been cooked. Having prepared the meal – and in good time – I joined Ajahn Asoko and Nick in the sunshine. Luang Por emerged, and we three Dhamma-lovers sat in a row on the cabin roof, enjoying the glorious weather. Humpback whales blew in the distance. Penguins popped up and gazed at us in bewilderment. 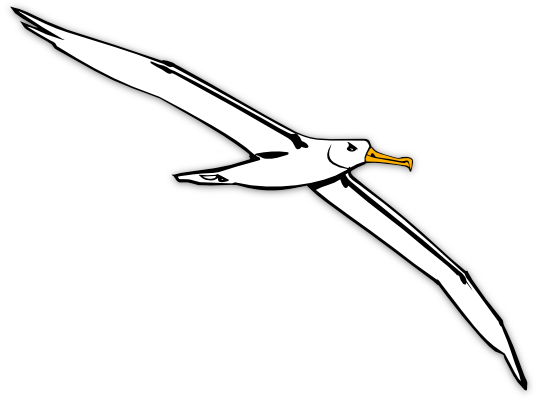 Albatrosses, sitting in big flocks on the water, got first to their feet and then to their wings as the big yellow boat drew nigh. From time to time either Nick or I would apologise for the mind-numbing racket of the engine and would offer to shut it down for a while. But Luang Por never responded to these suggestions and Ajahn Asoko always shook his head. So far as he was concerned, the best thing was to press on towards the glaciers as fast as we could. Luang Por responded very readily to my questions, and as we talked I felt him relax. Whatever his public profile might be, he’s evidently a very private person at heart. 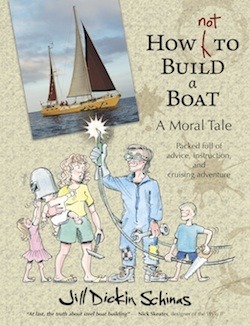 He’s surely not accustomed to being thrown into the midst of a family in their cosy little nest – never mind thrown into a small sailing boat! In retrospect it was just as well that the wind refused to blow, for had the yacht been bounding along over the waves in her usual fashion our honoured guest would probably have decided to call it quits. One man’s marvellous sail is another’s ghastly misadventure, and a good romp to windward might have been just one straw too many. Lunch was duly served at the appointed hour and seemed to be appreciated. Both monks accepted the offer of seconds, and although Thai protocol forbids the utterance of approving noises, English culture doesn’t – and so they did. I think they sensed my need to know that at least I hadn’t failed in this one respect. Luang Por chuckled – and by now I knew this to be the device which he uses when he’s not sure what to say. Luang Por seemed surprised to hear of what, I had been told, is actually a common ‘retreat syndrome’. According to what others had revealed, it’s quite the norm, even amongst old hands, to want to flee from the monastery before you’ve even unpacked your bag. One spends months looking forward to the adventure and then, on arrival, one baulks! When I’d finished speaking, the retired abbot of that self-same monastery grinned amiably, and then he withdrew into his secluded cell; and Mollymawk hammered on along the bright blue carpet, heading west as fast as she was able. 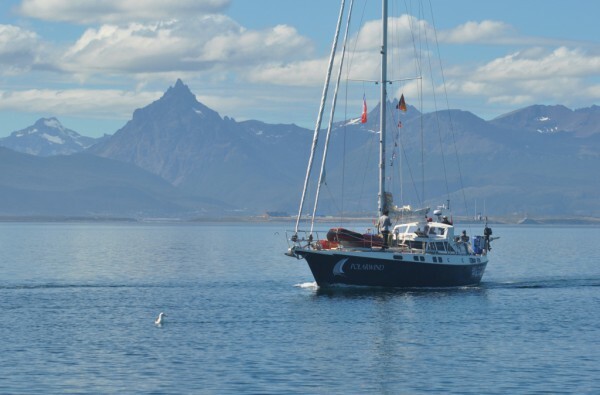 In the late afternoon we were passed by one of the fanciest and most renown of the local charter yachts, Polarwind. Not much bigger than Molly, she nevertheless provides accommodation for five or six tourists and two crew. 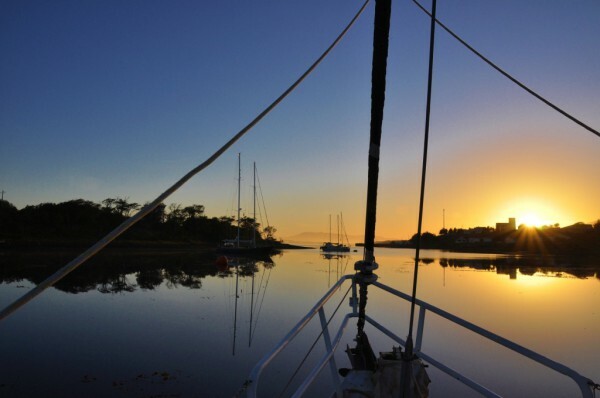 Her owner, Oswaldo, has been plying the waters of the Beagle Canal for 20 years and has 83 roundings of Cape Horn under his belt. Chatting to him on the VHF we learnt that, like us, he had just six days in which to take his guests to see the glaciers. “The same,” he answered; and when we reached that snug cove he was already there and welcomed us alongside. Oswaldo is well-acquainted with Mollymawk‘s interior. Seeming to take pity on our sienna-clad companions, who were obliged to ‘rough it’ with a bunch of scruffs, he presented us all with a fancy bottle of wine. Buddhists don’t drink alcohol, but the gesture was well-meant. Oswaldo’s own guests, though they were crowded into bunk beds, did at least have the use of a spotlessly clean bathroom, complete with door (but still, I may remark, without the use of a shower. 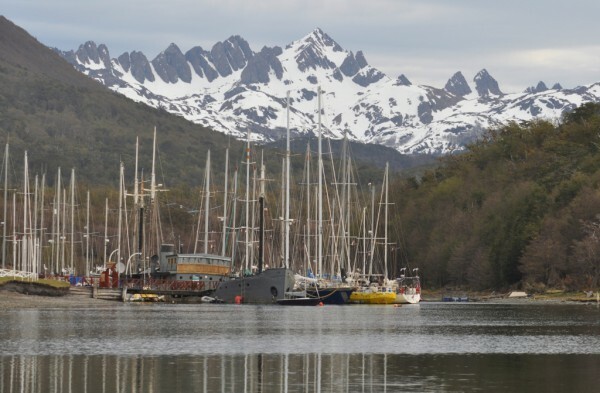 Showering is discouraged aboard any and all of the yachts in Tierra del Fuego because it fills the boat with steam and creates condensation). You probably think that there are doors on all bathrooms everywhere in the world, except our own; but it isn’t so. 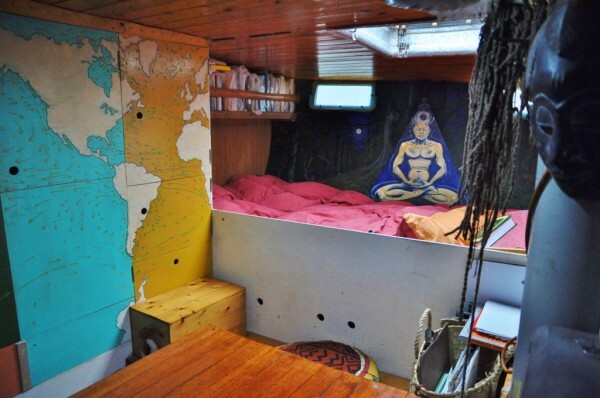 One of the biggest expedition yachts, Tarka, also boasts a loo in a corridor. And in her case, the guests actually have to climb over the loo to get to the cabin beyond. When I mentioned this to Luang Por Sumedho he first looked at me in disbelief and then, when he saw that I was serious, he didn’t just chuckle; he threw back his head and laughed. Ajahn Asoko smiled, and after Luang Por had retired for the night he said, “I think it’s going to be okay”. As we watched, the mink took his sinuous body into the water. He swam to the nearby kelp, ducked under the water for just a few seconds, and then surfaced again with something in his paws – something silver and slippery which was fighting for its life. Then, with the fish in its mouth, the little animal scurried back up the beach and into the bushes. Three times we watched the mink skip down to the water and catch a fish. So easy it was for him (or her) to find supper for his brood; and so hard it must have been for the fish to let go of their lives. Even in this tranquil corner, Nature was undeniably brutal. Every day, the mink must kill in order to carry on living, must cause suffering in order to avoid suffering himself. Is that the bottom line? Is life inevitably built on death? Is suffering the corner-stone of existence? Is it inescapable? The Buddha certainly held suffering to be inevitable. It was the subject of his very first lesson. Indeed, the Truth of suffering is at the core of all his teachings. And he taught that the only way of escape from suffering is through knowing that we are not what we take ourselves to be; through becoming Enlightened as to our true nature. And how does one do that…? Perhaps our visitors would show me the way. Your doing a great job without the dot com officer!